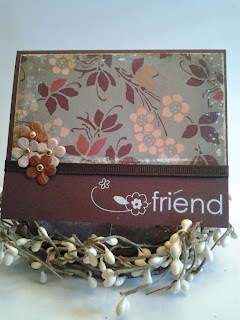 Distressed card I made with Cosmo Cricket and SU cardstock, Prima flowers, SU rub-ons and brads. Very pretty! Love the paper! Beautiful card Tammy. I really like the colors of your designer papers. Gorgeous! I love the natural colours. Beautiful card Tammy! You've reminded me that I need to take out my rub ons and give them some love! how pretty :) i love the paper and the rubon. great job!! This is lovely! Such warm colors and I love those flowers. Fabulous earthtones on this lovely card, Tammy!! wonderful card! Thanks for sharing your great card!